Designed specifically for use with CN-E COMPACT-SERVO lenses, the Canon ZSG-C10 Zoom Grip adds an ENG-style operation to your camera setup. It has an ergonomic form factor for comfortable operation and features a seesaw rocker for zoom control, as well as REC start/stop and ONE-SHOT AF buttons. Because the grip provides electronic control for the drive unit, rather than mechanically driving the lens itself, you can choose to mount it directly to the side of the lens (using an included screw-on rosette) or mount it to an ARRI standard rosette elsewhere on your shoulder rig, as long as the 20-pin cable is still connected to the lens drive unit. Box Dimensions (LxWxH) 8.3 x 6.1 x 6.1"
ZSG-C10 Zoom Grip for COMPACT-SERVO Lens is rated 3.0 out of 5 by 2. Rated 1 out of 5 by nolan from cheap feeling as a professional videographer I expect my gear to be professional and this isnt whaen used on the 18-80 on the 100 mark ii and the c200 its gets in the way of the other hand grip making it worthless as is also its very cheap and "plasticky" feeling I got this free with my 18-80 so its ok but I would not recommend buying this...plus if you put your camera on a tripod you have to disconnect and reconnect it everytime. Rated 5 out of 5 by Russell from Adds an extension for easily working the zoom from a tripod. The build-in Servo Zoom buttons on the lens work just fine for most handheld use and I would have to remove the built-in button unit to attach this device. The built-in buttons are hard to reach when the camera is attached to a tripod. 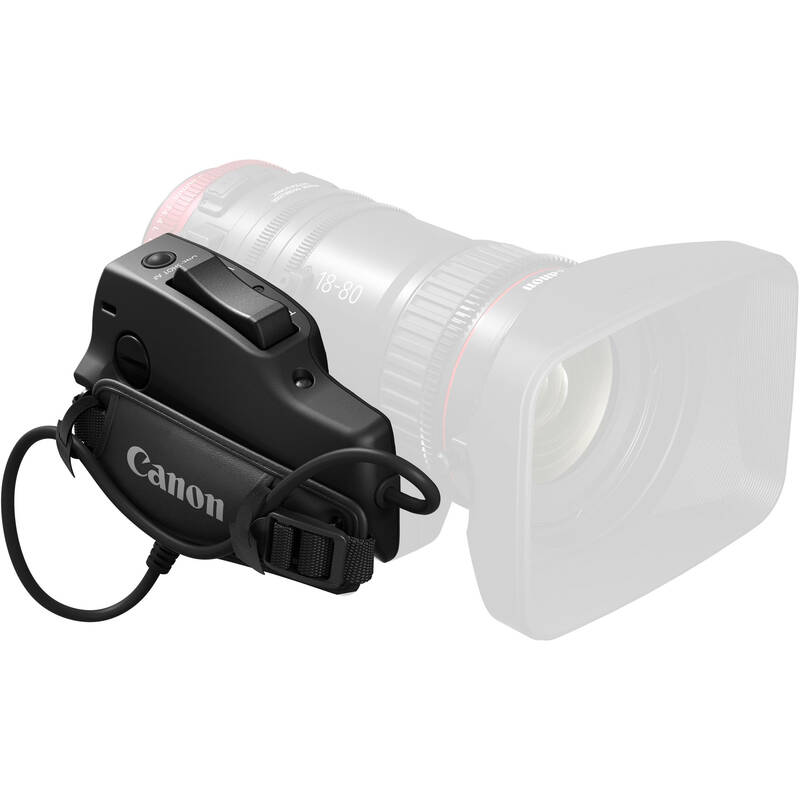 This Zoom Grip can be plugged into the Canon 18-80 T4.4 lens and operated from the tripod's location. Will I need this grip if I'm using the 18-80mm Lens on the Canon C200 or can the C200's Handgrip sort of replicate the functions of this grip? You would not need the ZSG-C10 Zoom Grip, as B&amp;H # CAE1880EF does have a basic zoom controller on it. However the C200 grip does not have a Zoom Rocker, so it is not a full replacement for ZSG-C10. Can a 20 pin extension be introduced into the system? If so what is the max length? Here is the one by Canon. It is 14'/4.2m. Canon 20-Pin Zoom/Focus Servo Cable (14') B&amp;H # CAZFSEC20P. Does this start/stop button trigger URSA mini? At this time, Blackmagic is saying they want to interface with this lens and it's controls however, they do not know when or if this will happen. Can CSG-Z10 be mounted on tripod arm similar to micro force controller or mounted on Zacuto arm in front of camera (off lens)? This controller can be used off the lens. The cable is approximately 10 /25cm. This should be adequate for use on the front right grip of a shoulder rig. However, it would be short for a tripod pan handle mount. At this time there are no custom lengths of extension cables for tripod use. There are cables for use on cranes but those are too long and expensive. Such as: Canon 20-Pin Zoom/Focus Servo Cable (14') B&amp;H # CAZFSEC20P or the more affordable and longer VariZoom Extension Cable for VZPGC20, VZROCKC20, and Canon ZSG-C10 Zoom Controllers (25') B&amp;H # VAVZEXT2025. is the zoom servo motor powered through the EF mount or is it powered externally? Normally it is powered through a Canon EF mount. There is a 12VDC sleeve jack on the rear of the lens. At this time there is no Canon approved 12VDC power supply for it. Can this lens work with a Canon ZSD-300D Digital Zoom Servo Control Demand for Digital ENG/EFP Lenses? Does it have the right I/O? Sorry, the Canon ZSD-300D Digital Zoom Servo Control Demand for Digital ENG/EFP Lenses cannot connect with the Canon ZSG-C10 Zoom Grip for COMPACT-SERVO Lens. You can mount the Grip off the lens but the cables available are too long and expensive. Perhaps you can contact a custom cable maker. Canon 20-Pin Zoom/Focus Servo Cable (14') B&amp;H # CAZFSEC20P or the more affordable and longer VariZoom Extension Cable for VZPGC20, VZROCKC20, and Canon ZSG-C10 Zoom Controllers (25') B&amp;H # VAVZEXT2025. Can the One Shot Auto focus button be remapped to work as a AF Lock? We are not aware of such an ability with this Zoom Grip. Will this work on the CN7X17? Unfortunately it will not. The ZSG-C10 is designed for Canon's Compact-Servo Lenses, which are B&amp;H Numbers CAE1880EF and CAE70200EF. However, the CN7X17 does come with its own zoom grip.